I was inspired by Morgan of Mojomade to try this hairstyle. I didn't have as much time to fishtail the braids, so I did normal ones, but it still worked. It turned out pretty cute in my opinion! So, this is what I wore for my coffee date. In fact, Corina took these for me right before I headed over to the coffee shop to meet Mr. Adorably Scruffy himself. This time around, I feel like I'm really starting off by showing him who I am. We talked about a lot of different things, occasionally falling into lulls of silence. He seemed shocked to discover how I'd capture lizards as a little girl and how well I knew my Pokemon (I know you'd approve Ali...haha, yes, we discussed Pokemon, and he still has his holographic cards). He was smiling in a pleasantly surprised way and commented how, "you're like the girl version of me." As the sun sunk lower in the sky, we walked back up to the park area, and he spotted the swing set that was nearby. So yes, for the next hour we played on the abandoned playground, went down the slide, and took advantage of the empty swing set as we casually talked. All I can say is that I had a fun time reliving my childhood on that playground with him. What a lovely outfit! I love the colours and the pants. :) You look gorgeous btw! I love you in teal!!! Your outfit is just so adorable - I love the color of your cardigan! And glad to hear that your date went well, it sure sounds like fun! I'm glad you had a fun date! Even if things don't work out romantically, it's good you've found a friend! Mint green is your colour, looks amazing. I totally want your necklace. Love your outfit!! You posts are amazing!! Followed! ;) By the way, where did you get you boots? They are gorgeous! you will not find out if it works or not when you don't try. so I definitely think you should give it a go and see what happens :) if you don't try you will probably just regret afterwards and that's never a good feeling. What a lovely outfit. The light blue/turquoise looks gorgeous against your skin tone. I love the colour of the cardigan and necklace! It goes really well with the outfit. You will always get me with a mint outfit - loove the combination with the grey items! Aw, you're adorable and that date sounded wonderfully romantic! Your hair is stunning too, I really like this look. And you look beautiful in mint, just beautiful! Oh my, almost forgot. Thank you for your comment on my last post, I was unsure as to whether or not to do it, so thank you! That sounds utterly lovely and it makes me smile so much to hear. It's a little bit wonderful to hear a similar story, but my first date with my now-husband six years ago was when we went for pancakes and then decided to spend the rest of the afternoon in a playpark. So I can only recommend it as the best place to form relationships! Cute hairstyle. The best relationships start out as friends. Be happy hon!! This hairstyle is the cutest! And you know how much I love mint, so this is lovely. These pants are always a winner in my book. And I'm totally in love with your hair, stunning! Super cute hairstyle. You look lovely!! Just bumped into your blog and love it. You are super cute!! 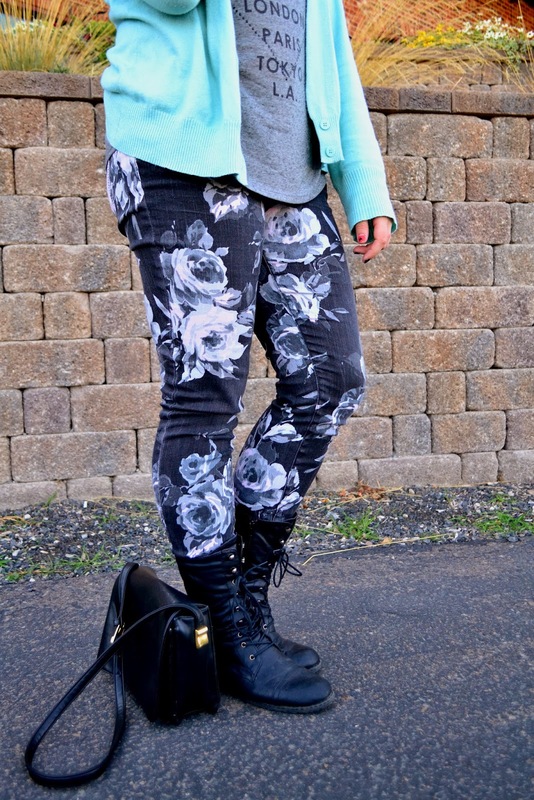 The printed floral jeans with teal cardi is perfection. Lovely color combo! I love the mint accents and that shirt is wonderful. I would love to travel to all of those places. 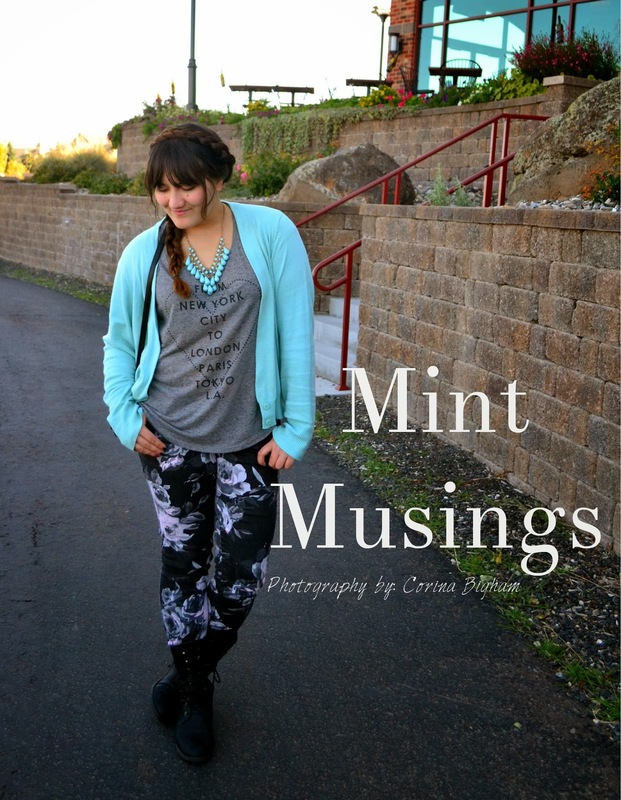 I love how you wore mint for fall! It looks great with the edgy combat boots:) And awww your date with Mr. Adorably Scruffy sounds so sweet! In the most non violent way, I want to rip those pants off your body and steal them forever! Your hair looks so cool! I ought to play around with my hair more often. Those bright blue pieces are so eye-catching and cool. And your hair looks so fantastic like that (but I guess I always love your hair :D). So enjoy and appreciate the shot of those amazing legs. Always brightens my night :) And so glad to have you stop back by my blog. Low-self-esteem me was worried I had bored and/or annoyed you into fleeing. He is not that brightest of fellows :) So lovely, dear! WOW, that shade of blue is sooo beautiful! I also love your hair! Hi Linda, we really need a hairstyle tutorial now...you look beautiful! This minty shade is so fresh and looks pretty on you. Thats so sweet, I think its a great compliment if someone said 'you're the girl version of them', it means they can relate to you on a very personal level moreso than with anyone else....Thanks for sharing your thoughts with me, wishing you a good start to the new week! That tee is SO cute...love it with the floral pants! Swings, pokemon, and coffee shops... and scruffy face... hmmm,hmhmmhm this sounds like a grand opporunity for you, Miss Linda! I can't wait to hear more. Don't doubt yourself, because you're an AMAZING LADY with a stunning personality and any dude would be glad to call you his ladypartner. Onto your outfit... your braids are stunning, stunning! I seriously love that hairstyle. I wish mine was long enough to style that way! *__* I also dig the mint. 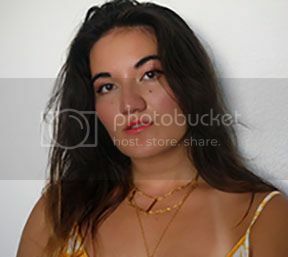 That necklace is so lovely! Linda! this is the perfect date outfit! i love the sweet hairstyle you sported! it goes really well with your floral pants and girly mint cardi and necklace!!! really Chic and romantic i guess! that was a good date! from what you said, it think you had a great time!! You LOOK like you're in love! Linda you look so beautiful in these pics. You have a glow about you. I love this mint & black. I'll have to try that. I like the effect. Keep having fun with him! Seems like you guys are really connecting. That's good. i love that kind of mint, such a pretty colour! and aw what a cute date story!! Nice hairstyle! And the outfit is great, I fell in love with your trousers. Seriously obsessed with this whole outfit! Sounds like you've had a perfect date! Hope it works out with your mr. Adorable :) One thing I know for sure - you look gorgeous! You look lovely in mint. I'm glad that the date went well, it seems. Hope The Mister in question is feeling better. Love this cardigan and your floral jeans are gorgeous! I really like how you did your hair her, the wrap around braid with the other loose is really pretty and different! I'm sort of wishing I hadn't chopped mine off now, this looks so pretty. I forgot to mention that you're the Queen of Printed Pants. Your hair!!! SO gorgeous girl!! Love the outfit too, those pants are to die for.